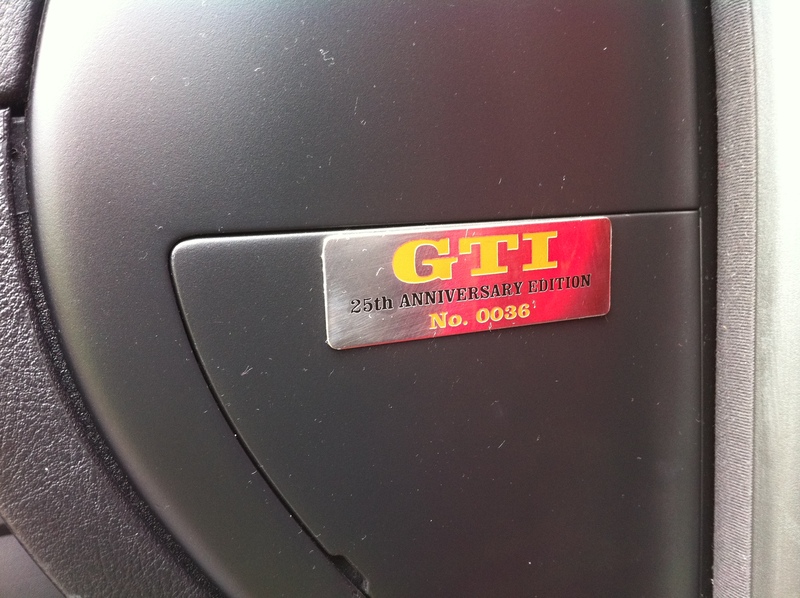 VW GTI 25th Anniversary buyers guide – what to look out for! So there are 300 silver, 300 red and 300 black in petrol. Then 300 silver, 300 red and 300 black in diesel – After speaking with VW, the owners club have heard that VW never made the full 1800! All Anniversarys are uniquely numbered – the numbered plaque should be on the cover of the fuse box which is on the end of the dashboard at the driver side, this number should be between 1 – 1800. There are some that may be over 1800, this is because if an Anniversary has it’s plaque removed / stolen then VW won’t issue another one to an Anniversary that has already had its plaque issued. 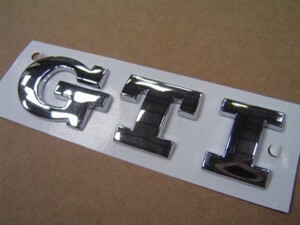 Instead VW will be able to supply a new plaque but it will be from 1800 upwards. The Anniversary Golfs were ONLY made in three doors and only the three colours stated. 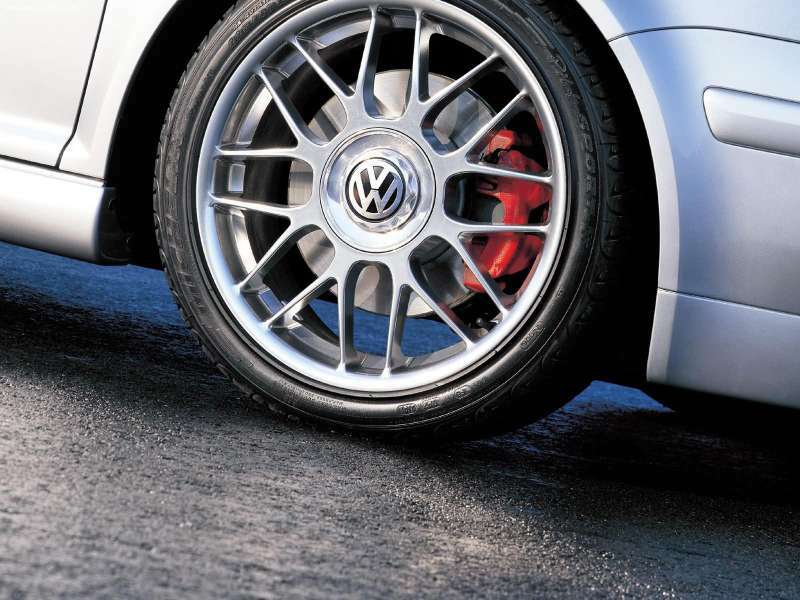 Standard equipment – what it should have straight from VW! BBS spanner for the centre nut cover. Roof lining, interior light and A/B/C pillars are black. Carpet mats trimmed in bright red, front and rear – very rare now! Headlights have black surrounds inside, standard mk4 golfs are chrome. Split folding rear seats with storage room in the rear centre arm rest. Temporary steel space-saver spare wheel 16” anything smaller wont fit over calipers! 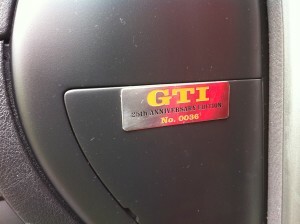 The Anniversary numbered plaque should be on the fuse box cover, inside the drivers door on the end of the dash. The centre caps on the wheels suffer with ‘white worm’ this is where water ingress damages the face of the VW logo. These are not cheap from VW to replace (circa £45-£50 per cap) a common solution is to opt for the BBS centres (80mm) or hunt them down on eBay. Check to make sure sure the BBS black tool is present to remove the centre caps. If this is not present and spanner type tool can be purchased online. Check the front and rear valances for any damage. OE (original equipment) are now obsolete and only aftermarket copies are made. Secondhand originals are expensive. The headlights should have the built in fog lights and have the black surrounds inside. 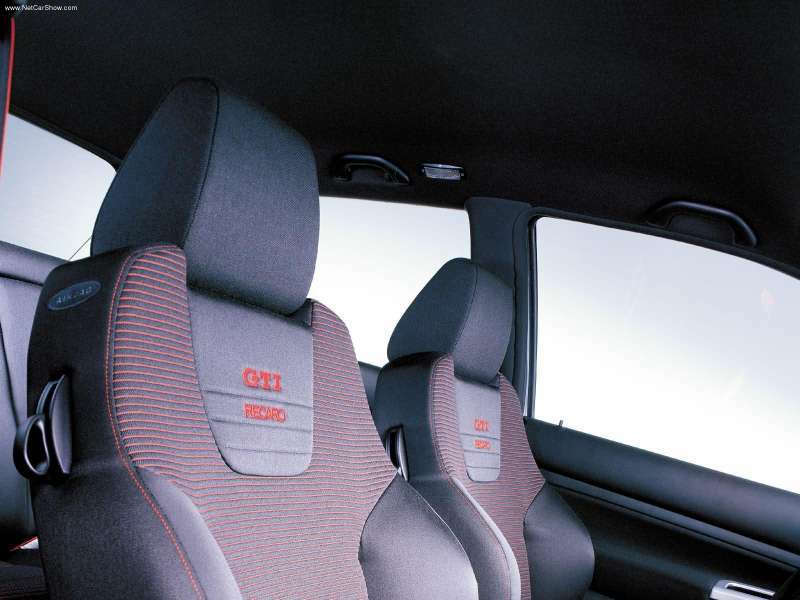 The standard MK4 Golfs have chrome surrounds. If your Anniversary has the common chrome surrounds it might be worth asking why? – has it been in a front end smash where the repairer put the standard mk4 headlights in.. if it was in a smash, what else was damaged. Anniversary headlights are expensive to replace, and are a common modification to the standard mk4 GTI. Look for rust round the lock on the tail gate – possible leak from rear washer. Also check the wings, mud etc builds up under the arch liner and sits against the wing causing rust if not cleaned out and allowed to dry. Check the rain gutters on the roof – make sure there are no signs of rust on the roof. Foam wear on drivers seat – very common at time of writing this guide VW still sold the seat base foams for £82 and the back rest foams for about £200 – the material is still available, but stocks are running low. A common fault on the MK4 was for the rear wiper motor to leak causing screen wash to leak in to the boot. This would not only cause a mess it would damage the tailgate lock. If the rear wiper motor isn’t working, or no screen wash is reaching your screen, you may have a leaky motor. Check the boot and tailgate lock for any signs of water damage. Also, check the roof lining on the N/S. If the washer jet is blocked the back pressure can blow the connector in the water pipe which is in the roof lining on the N/S near the C pillar. Alarm going off on its own. Boot not locking on central locking. There are a few common MK4 faults that attack the driver and passenger doors. 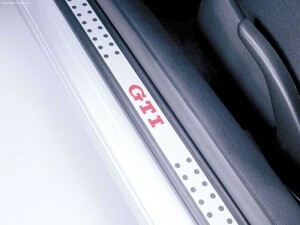 These are fault locking modules, window regulators and door cards/ trim. Car re-locking itself before you put the keys in the ignition. Door ‘puddle’ lights and interior lights not coming on. Doors not locking correctly or unlocking on their own. Door open sign on dash even when doors closed. The lock modules suffer from ‘dry solder joints’ this is down to the solder on the PCBs (Printed circuit boards) becoming dry and cracking with all the door slamming. This causes a bad contact. You can either buy a replacement module, or if you are handy with a soldering iron you can reflow the poor solder contacts. This can be anything from the window motor being very slow to raise and lower the window or the glass falling in to the door. The window regulator has plastic clamps to hold the glass, these break and have been replaced with stronger metal clamps. All parts are widely available. Engine, suspension and service type stuff! Rear engine “dog bone” mount – if you hear knocking when you turn the engine off, this is the likely culprit. Oil level – if low could be a leak or poor maintenance? Coolant level is this ok? if not – possible leak or poor maintenance? Take the car for a run. 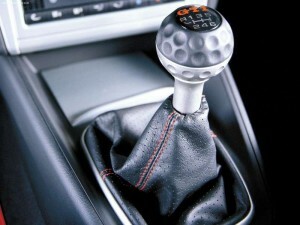 Check it goes in to each gear smoothly, if you have any trouble check to see if the clutch has been replaced?!? – if not this can be a costly repair costing close if not over £1000 to be done. Does it pull well? is it hesitance at all under boost? – The coilpacks are a common item to go down and maybe replaced for free if they haven’t already been replaced by VW – give VW your VIN or reg for them to check. Chill man! – is the Air con working well? Does it get cold quickly? – if not when was it last gassed? Turn the air con on, pop the bonnet and look to see if the pump is spinning without any excessive movement? if the pulley is on its way out a replacement from VW will be £800+ for a pulley change, or £700-£900 just for a pump plus fitting! When you switch the aircon on you should hear a “click” of the aircon pump clutch engaging. Also when you turn the aircon on the engine fans should spin on lo-speed. If not then it’s probably a faulty FCM (Fan Control Module), blown lo-speed resistors in the fans or a blown fuse (check the ones on top of the battery) – all quite common faults for Mk4 Climate control. Has the Anniversary been modified? If it’s been lowered drive it and go lock-to-lock and listen for any nasty grinding noises, if there is it’ll probably be the front Anti Roll Bar rubbing on the driver-side drive shaft, means it’s too low and needs the ARB changing for an Audi TT one and fitting adjustable droplinks, or raising the ride height. The air vents inside are commonly replaced with the illuminated Bora vents, sometimes people make poor wiring looms or buy the correct looms. Remember if you have any doubt that it is a true Anniversary ask to see the V5/ log book – it should be listed on there! If you have any doubts or questions then please ask on here, we have quite a lot of Anniversary knowledge between us!